and transforming them into signs you'll use every day. 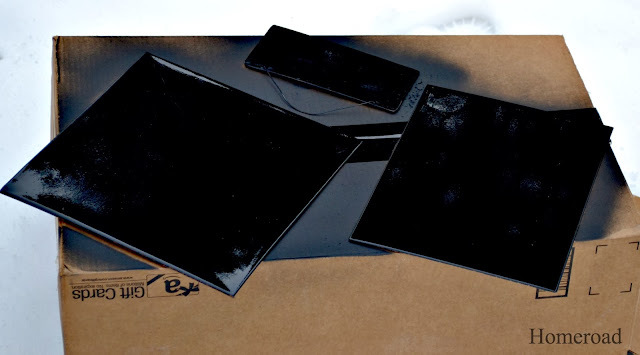 The first thing I did was to take the signs outside and spray them with chalk board paint. See a list of products you can use to make this project at the bottom of the post. 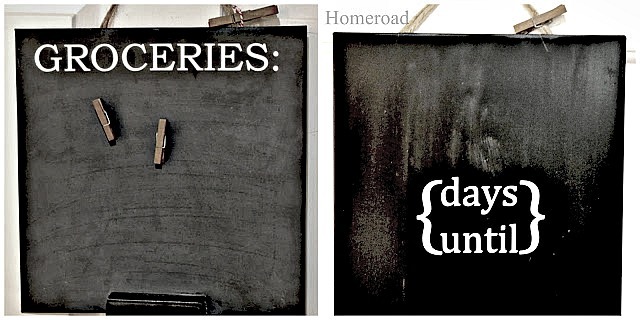 I had never used the spray chalkboard paint before and WOW! Winner! I may never go back to the chalk board paint in the can. The spray was way easier!... except for the snow. 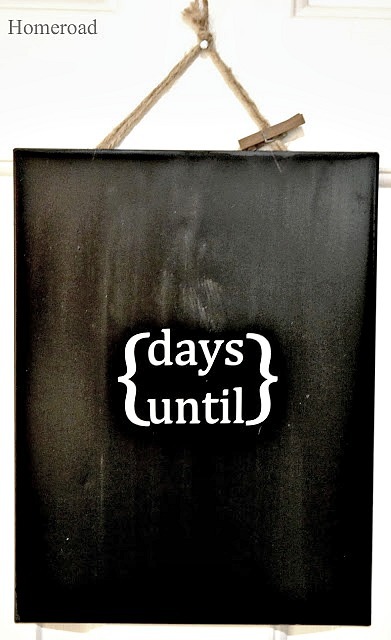 The first sign got vinyl lettering in the center so it can be used as a count down for a special occasion. On the second sign I also used vinyl lettering... and attached a chalk board ledge to the bottom. 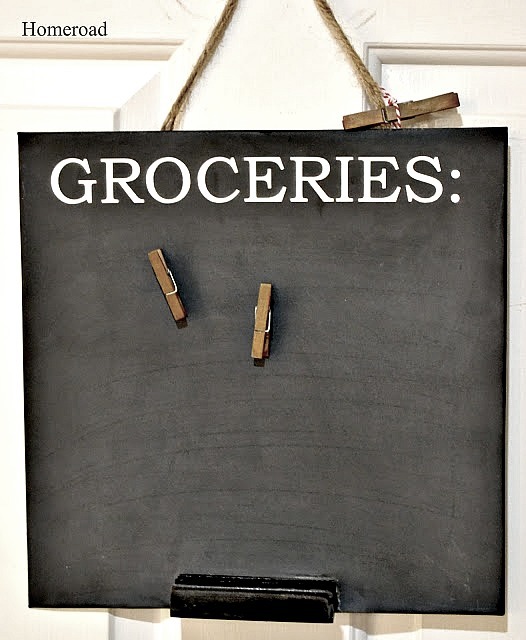 It's a great place to keep track of the items you need at the store. And the fact that these metal signs are magnetic is a bonus! to bring when I go to the grocery store. 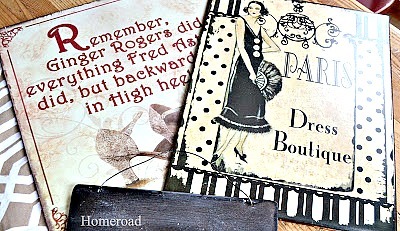 my latest DIY project will be sent straight to you! 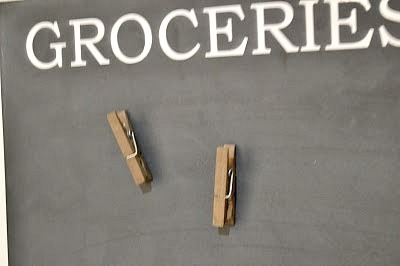 Those signs look great Susan, specially the 'grocery' one with the clothespins!! Thanks Heather! That one is my favorite! How are you making out with the snow today????? I have nowhere to go thankfully. =) Love your signs. I really need that grocery one! Very clever Susan. I have used the spray chalkboard paint and can't seem to get an even covering. I just purchased a can of it to try painting it on. We'll see. Love your little signs. Did you have to prep the metal first? Didn't prep a thing, though you could sand it a little... I didn't and it is fine :) Thanks! Cute and affordable idea, Susan! I did over a metal sign I had but wasn't using anymore several years ago. I did a Ballard copycat from ones they had as just magnetic boards. I still use it today in our laundry room. Love doing copy cats Kathy! Thanks for the visit! Great idea! I'm redoing my son's bedroom this month - I may just have to bust one of these out for his desk wall! Go for it Mindy! Thanks for visiting! Love these. I've been using the spray chalkboard paint for a few years and as long as you spray very light coats I find that I have no problems with it! I've used the spray paint kind, but not the one you have to brush on. I thought it went on great too. Good timing on this post. We play cards most Saturday nights and at the end of the year everyone always says "oh I never won this year" and we know they do, so this year I'm keeping track. Perfect idea. You must have a way better dollar store than I do. Haha. Great idea for a simple upcycle. Nice article, Susan with great ideas! Thanks a lot! Thanks so much for visiting Kate! !